I dati rilasciati dal Copernicus Climate Change Service – C3S – mostrano che il 2018 è stato il quarto di una serie di anni eccezionalmente caldi. Il servizio di monitoraggio dell’atmosfera di Copernicus – CAMS -, unitamente a C3S riporta che le concentrazioni di CO2 nell’atmosfera hanno continuato a salire. The last four years have been the warmest four on record, with 2018 being the fourth warmest, not far short of the temperature of the third warmest year 2015. 2018 was more than 0.4°C warmer than the 1981-2010 average. The average temperature of the last 5 years was 1.1°C higher than the pre-industrial average (as defined by the IPCC). Europe saw annual temperatures less than 0.1°C below those of the two warmest years on record, 2014 and 2015. CO2 continued to rise in 2018 and increased by 2.5 +/- 0.8 ppm/year. The C3S temperature data for 2018 is the first complete set to be published including annual anomalies and globally averaged fields. C3S can provide the global picture so rapidly because it is an operational programme, processing millions of land, marine, airborne and satellite observations daily. A mathematical model is used to bring all these observations together, in a similar way to what is done in weather forecasting. The benefit to users of the data is that they have an accurate estimate of temperatures at any time or place they choose – even in sparsely-observed areas like the polar regions. 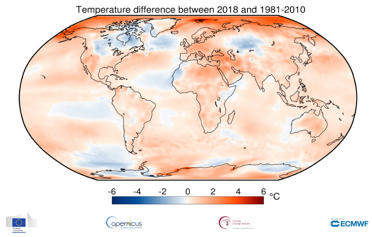 The Copernicus C3S data show that 2018 surface temperatures were more than 0.4°C higher than the long-term average recorded over the period 1981-2010. The most pronounced warming compared to the long-term average occurred in the Arctic, in particular in and north of the Bering Strait between USA and Russia and around the Svalbard archipelago. Most land areas were warmer than average, especially Europe, the Middle East and the western USA. In contrast, the northeast of north America and some central areas of Russia and central Asia experienced below average annual temperatures. Apart from a relatively cold February and March, Europe saw above average temperatures during all months of the year. Starting at the end of spring and continuing well into autumn, and in some places even winter, northern and central Europe experienced weather conditions that were persistently warmer and drier than average. Air temperature at a height of two metres for 2018, shown relative to its 1981–2010 average. Running 60-month averages of global air temperature at a height of two metres (left-hand axis) and estimated change since the pre-industrial period (right-hand axis) according to different datasets: ERA-Interim (Copernicus Climate Change Service, ECMWF); GISTEMP (NASA); HadCRUT4 (Met Office Hadley Centre), NOAAGlobalTemp (NOAA); and JRA-55 (JMA).